presented at the Association for Applied Interactive Multimedia Conference, July 21-23, 1994, Charleston, South Carolina. @cogdog Seeing us around laptop at District in '93. You & Jim Walters saying "Mosaic LofC would look like this…if it was working!" 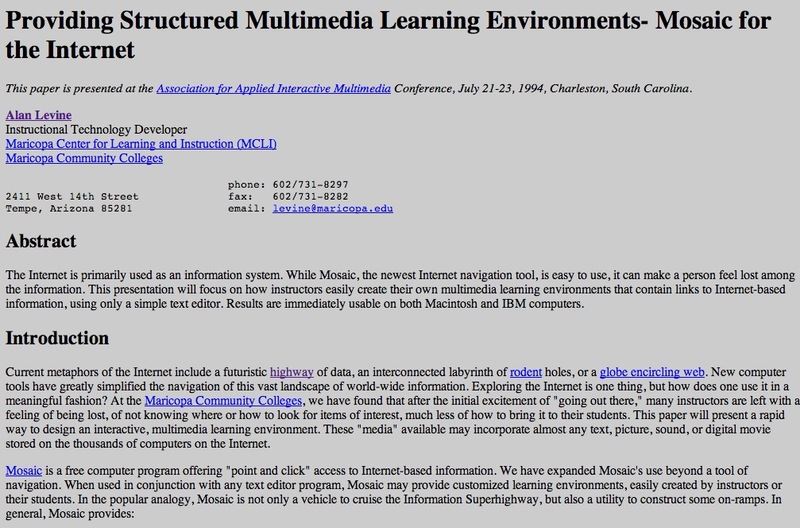 Having done my early bits of exploring of that grey background era web in late 1993, starting what would become the Writing HTML Tutorial, I combed my archives to find what might have been my first ed tech conference presentation– Providing Structured Multimedia Learning Environments- Mosaic for the Internet presented for a conference in sweaty Charleston in July 1994. The Internet is primarily used as an information system. While Mosaic, the newest Internet navigation tool, is easy to use, it can make a person feel lost among the information. 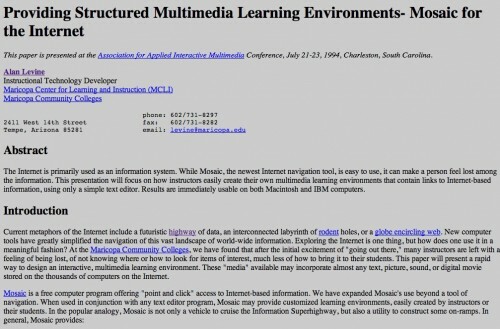 This presentation will focus on how instructors easily create their own multimedia learning environments that contain links to Internet-based information, using only a simple text editor. Results are immediately usable on both Macintosh and IBM computers. 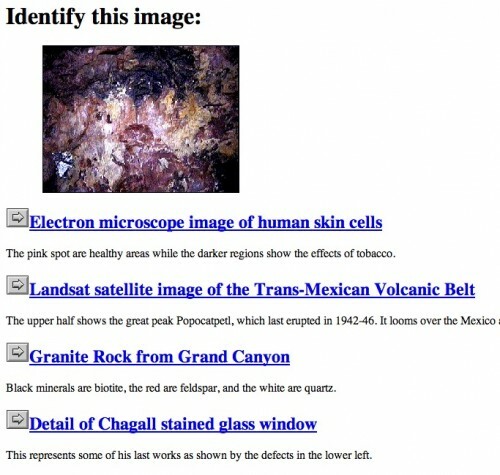 I actually used this web page as both the paper, and my presentation– using the web to present about the web. Since most of my web content for my previous two employers has been mothballed; I rely on my own archives… I have copies of almost everything I have ever made scattered in a few hard drives. Mosaic is exciting because of its ability to easily retrieve and deliver multimedia via the Internet. The interface is intuitive to most people in the way it associates relevant information. The excitement grows when one understands how easy it is to customize or structure the access to the vast array of information on the Internet. For our faculty, developing multimedia documents for the Mosaic is meeting a desire to provide their students access to up-to-date information. Yet, the development of a Mosaic-based lesson is something that instructors (and their students) can do without computer programming. It draws upon existing text and media, and it is quick to produce and deliver multimedia dcuments. Mosaic may or may not be the ultimate means of traveling the much discussed “Information Superhighway.” However, it is a step farther in that direction. At the Maricopa Community Colleges, we are actively experimenting with Mosaic’s use as a means of receiving as well as providing information for the learning of both our students and their instructors. I created something on a computer just shy of 20 years ago. And it still functions as it did then. How many other technologies from that era are still usable? How much digital content from 1994 can you still even view today? I remember you when you were messing around with Learning Objects… :-) It is interesting to think about 20 years on the Internet. So many people think of the net as some shopping tool. It is folks like you that saw the possibility of it as a learning tool. I have enjoyed following along. The fact that something digital made 20 years ago can still be opened and still works is no small thing. I remember creating projects in hypercard, StorySpace, Macromedia Director and other environments that are no longer supported. Furthermore, they require computers and operating systems that would be hard to find now. Even if I found an early Macintosh running an old operating system, I’d have to find a working Syquest drive (remember them?). An open web, common, non-proprietary file formats and secure storage and hosting are all important. Unfortunately, we often discover this after we have made decisions to use software, systems and environments that lock us in and provide us with ease-of-use, but no real control. How Do Learners Advocate for Themselves in a Class of 16,000?